Fairmont Maldives – Sirru Fen Fushiis located approximately 230 km North of Male in Shaviyani Atoll, a pristine natural marine environment, undisturbed by development. The seaplane transfer takes 55 mins with an alternate route possible via domestic flight to Hanimaadhoo airport. The destination is in many ways a new frontier, an ancient sheltering point known only to wise seafarers who enjoyed the fair and tranquil waters courtesy of the 600-hectare lagoon that surrounds the island. It is was their Secret Water Island. 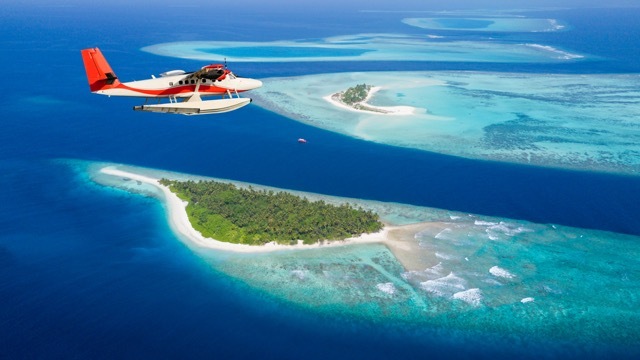 Seaplane: A 55-minute ride over a stunning marine seascape awaits you before touching down directly at Sirru Fen Fushi. Prior to take off you can relax in our elegant lounge at the terminal for drinks and fresh pastries. Roundtrip transfers are priced start from USD 500 per person. Wheel-Based Aircraft: Domestic flights on Maldivian Airlines are available to Hanimadhoo followed by a 50 minutes speedboat transfer to the resort. Our speedboat transfer service operates 24 hours and can accommodate early morning and late evening flights. Roundtrip transfers by Maldivian Airlines priced start from USD 500 per person including speedboat transfers.